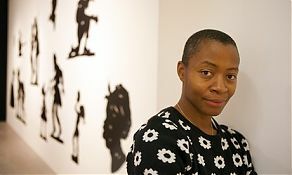 Two years ago, Kara Walker came across a news story in an edition of the 19th-century Atlanta newspaper the Daily Constitution. The year was 1878; the piece described, in excruciating detail, the recent lynching of a black woman. The mob had tugged down the branch of a blackjack tree, tied the woman’s neck to it, and then released the branch, flinging her body high into the air. Her London show is not large – just three rooms, with 11 recent works – but it is significant and overdue. Walker is one of the most uncompromising contemporary American artists, not just for the quality of her work – which comprises drawing, film, and her signature medium, silhouettes – but for the fact that her art engages with what many would rather forget: the appalling violence meted out to the black population before and after the American civil war and the abolition of slavery, and the legacy of racism that still shapes the US political agenda. Walker is at her most provocative when interrogating the stereotyping that defined race relations in the antebellum south, and still exists today. The largest room in her show is lined with “wall samplers”: the cut-out silhouettes that show figures engaged in violent or exaggerated acts: a man bending down to fellate an oversized phallus; a woman in a wide-skirted dress holding a severed head. The effect is to make us question not only the cultural representations of black people (there is, as Walker points out, a whiff of “minstrels and blackface” about some of the figures) but also our assumptions about how skin colour defines anyone’s physical characteristics and behaviour.